Christmas Countdown 2012: 12 days! Second day in a row for poultry singing Christmas songs! Not sure if that’s sacrilegious, but hey — you can’t go wrong with the Muppets, eh? Only a dozen days to go ’til Ho! Ho! Ho! 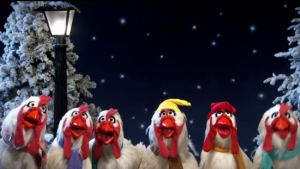 Enjoy the Muppet chickens singing — er, clucking — Joy to the World!